None of us want to admit it, but test prep is a crucial part of many of our jobs. We have to introduce kids to the format of the test before they get to the test. We have to teach them how to respond to the sort of questions the test will ask them. And we have to teach them to read and answer thoroughly and completely. I don’t know about you, but most of my kids try and take the easy way out. Q: “How did Jake’s feelings change throughout the story? Support your answer with details from the text.” A: He was sad and then he was happy. Working with RtI students means this is what I see all day long. All day. A good part of our time is spent teaching the kids how to respond to questions and proving their answers using the text. We would much rather see an answer that says “Jake’s feelings went from sad to happy. In the beginning, he was sad that he didn’t have anyone to play with. At the end, he was happy because his best friends came over.” Most often, we can get the kids to tell us that in words when we ask, but when we ask them to write ….screeeeeeeech…. it comes to a halt. So, we practice. With older kids, we practice about oncce a week. We give the kids a format similar to the test where they have the text right there with them to help them respond. We teach them to use their highlighter or pencil to prove their answer in the text. And we teach them to write in PQA. What’s PQA? 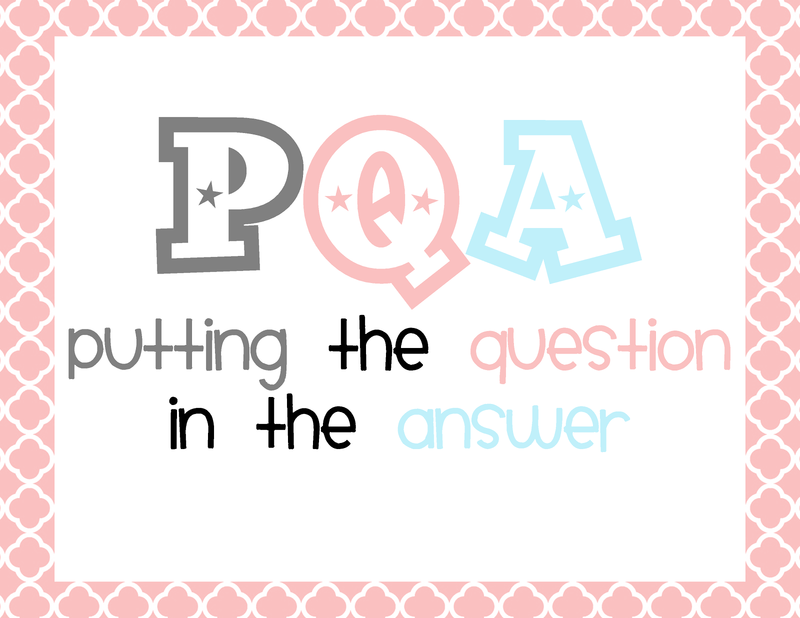 PQA is Putting the Question in the Answer. I thought this was a common acronym but after asking around, I found out it’s not. If you want to see my post with an alternative poster and posters for other acronyms on this skill, click here. Every district I’ve worked in uses that acronym but I know many others do not and have something else they use. We begin really introducing it in 2nd grade and ask the students to do it in all responses beginning in 3rd grade. You might be shocked, but I still have to remind our 7th graders that they need to do it when they respond to a question. Yeah, you’re a teacher, you probably aren’t shocked. When we get back from break, I’m going to begin to work through passages with constructed response questions with my 2nd graders. They’ve already begun doing it in their classrooms, but we haven’t worked on it so much in RtI yet because we’ve been working so much on decoding. They’re ready now. But, one thing I noticed was that I could not find passages and questions I could use. Seriously. I looked through the books I had. I looked through the books of others. I looked online at TpT. I couldn’t find what I was looking for. Yes, I found passages but all of the questions were very-rote and/or multiple choice. There wasn’t anything that I could find that was at a lower reading level but still open ended. So I made some…. These two pages are samples so that you can see and try them out with your students if you’d like. I put the first two pages in the Preview for free. Just click on any of the pictures to head to my store and then click on the Download Preview button to download the preview with the 2 passages and questions. With my third graders (and it’s applicable for 4th & 5th too) in the spring we really start working on applying these skills with much more complex texts. That text complexity is crucial leading into our state testing. We apply this skill using my African-American Heroes set. The students learn about important people in our history but really work to answer constructed response and extended response question using textual evidence. It’s also perfect for Black History Month since it’s just before state testing begins. It includes not only short answer constructed response type questions, but also extended response questions. It really helps students apply opinion writing to a text citing textual evidence to support their reasonings. It’s been a great practice for my students leading up to our state testing in March. You can try out this set by clicking on any of the pictures to head to the product on TpT and downloading the preview file. Because not every student is ready for these, and because this skill should be introduced in younger grades, I also made a set for younger students. What do you do to get your kids ready for the mandated test? Do you have any tips or acronyms to share? I LOVE this acronym! It's new to me and I am definitely going to teach this the day we get back 🙂 I have been saying the long version: something about using parts of the question as your sentence starter, blah, blah, blah, but this is way more concise and clear 🙂 Thanks! You're welcome! I'd love to hear how it goes after you've been using it a while! The school I student taught in used a different acronym–PQPA (part of the question in part of your answer). I use that in my fourth grade classroom, but I think I like your acronym better! Oh, I like that too! We useTTQA: Turn the Question Around. Thanks for sharing!! That's been pretty common based on what I've heard people say. This looks awesome Tessa! I'm pinning them right now! Looks like a great packet, Tessa! I've been working on this with the kids for years and never thought of the pqa acronym! I love it! These constructed responses are so tough for the kids, but it's a very teachable skill! Yes, we'll be working on it for the rest of the year, but hopefully it'll set them up for success for next year! This looks great! I've never heard of the acronym but completely understand what it is. Great idea to name it like that! Do your students have open ended questions on their state tests? Just curious! We don't have an official 2nd grade test yet. There's one that we can use, but don't have to. But on the third grade test there is an entire open-ended test in reading and math. Because writing in complete sentences is so difficult, we start working on it before. Do you all have a test and it's not on it? OKay, could your new look BE any cuter!?!?!? Tessa, I LOVE your new blog redesign! Precious! Oh, thanks Gladys. I do too! I am beginning Comprehension Tutoring on Tuesday. I will use these passages for sure! Most of my students are RtI students and need a lower level of reading. I worked really hard 1st semester to get them to read close to "on level", now I'm working on comprehension. That's basically where I'm at with my kiddos too! I thought you'd like to know that I was using your PQA poster in small group today when my principal and the school's instructional specialists came in to observe–and they loved it! I was working with my kiddos on using textual evidence to support their statements, while making sure their answers were addressing the question. I stumbled across this post a few weeks ago thanks to Pinterest. I immediately started using PQA in my third grade classroom. Now my students can tell me what it means to PQA and they're really getting the hang of it. Thanks for sharing this! I'm so glad it's working for you! I had not heard PQA…I have used TQA (turn the question around) but now the big push is the word "claim". This is the term being used by PARCC (our testing provider for Common Core in Ohio). So we are now using that term. Honestly, my third graders are struggling with that term, but seem to understand TQA much easier. So I am using both to transfer understanding. Yikes! I love this acronym, but I wish you had your poster in black and white. Is there any way you could do one in black and white? Please, pretty please? I'm confused. Are you referring to the poster? That's only available here on my blog and is free. There's nothing to purchase. Thank you for this! It’s so hard to find things like this online! We use the acronym POTQ – part of the question.